Theatre Is Easy | Reviews | Mad Libs Live! 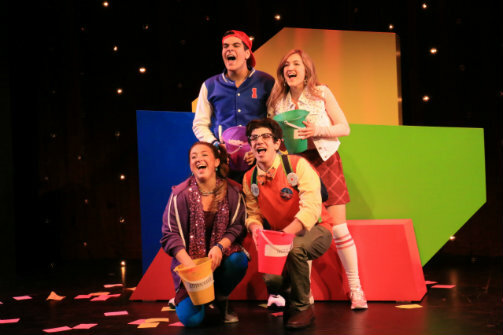 Clockwise from top left: Jenfranco Cardentey, Lindsey Brett Carothers, Max Joseph and Melody Madrasz in Mad Libs Live! BOTTOM LINE: A sparkly, courageous and fun interactive musical inspired by the classic word game Mad Libs. Mad Libs Live! begins with four teenagers from Blankville Central High School with little in common, coming together to form a singing group to try and win the singing contest “Teen Superstars!” There is pretty Virtuosa (Lindsey Brett Carothers), athletic Gogo (Jenfranco Cardentey), science geek Geyser (Max Joseph) and writer Merrily (Melody Madrasz). The musical is set during the live competition. However, there is a problem: they find out that the words are still missing in their songs right before their first number in the contest! So they need to come up with a remedy. They decided to use the nouns, verbs, adverbs and adjectives collected from the audience (before the show) to fill in their missing words. The result is a hilarious whirlwind of silly, bizarre, ridiculously laugh-out-loud songs—just as what you would expect when you played Mad Libs as a child. Except this time, Robin Rothstein and Jeff Thomson have created a musical where the actors pick out (and act out) the randomly chosen words, live. Mad Libs was invented in 1953 by Leonard Stern and Roger Price. The original Mad Libs consisted of a book with a short story on each page with many key words missing, replaced by blank spaces. Beneath each blank space is a specified category such as a noun, a verb, or a place. One player asks the other players to contribute some words for the specified type for each blank, but without revealing the context for that word. Mad Libs Live! makes use of that fill-in-the-blanks idea throughout the show, such as in each of the four main characters’ solo songs, as well as in Merrily’s love poem. Especially engaging is Max Joseph’s rendition of the astrology nerd Geyser, though his enticing lower voice could be balanced better with the background music in his energetic solo. Lindsey Brett Carothers does well overall, especially in her catchy, Carly Rae-like solo performance at the opening. Jenfranco Cardentey is solid as Gogo, a caring and strong older brother of Virtuosa, who watches out for everyone in the group. Melody Madrasz has some memorable performances as Merrily and I would love to hear her sing more. In the end of the story, lessons are learned and the friendships made are much more precious and important than the outcome of the competition. I recommend this fun, goofy, interactive musical for the whole family, especially for children over the age of 7. Mad Libs LIve! has book and lyrics by Robin Rothstein and Music by Jeff Thomson. Directed by Austin Regan. Choreography is by Robin Levine. Production Design is by Julia Noulin-Merat. Music Direction is by Camille Johnson. Lighting Design is by David M. Upton. Sound Design is by M. Florian Staab. Production Stage Manager is Alfredo Macias. Produced by Ava, Max & Peter Cane. The cast is Jenfranco Cardentey, Lindsey Brett Carothers, Max Joseph and Melody Madrasz.